The future of retail is AI. Now, of course, we're an AI company. We have to say that. But this isn't just a prediction we're making - it's a statement based on actual consumer expectations and resource shifts that are already happening today. In fact, Gartner predicts that by 2020, artificial intelligence will be used by at least 60% of organizations for digital commerce. Let's look at a few examples of how AI is already being used by retailers to drive revenue and provide customers with better experiences. for driving retail sales in our retail ebook! 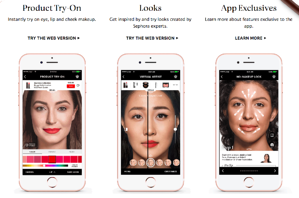 Sephora’s Virtual Artist app enables shoppers to try on products virtually via augmented reality on their phones. Recently, the brand expanded on this capability by introducing a color match tool, which is powered by AI. This tool determines the particular shade of a product within a photo and makes product recommendations for similar items available at Sephora that the consumer can then try on and purchase. Enabling customers to find the right product at the right time has been a constant battle for retailers. With computer vision, surfacing exactly what people want has never been easier. Plus, if an item is out of stock, retailers are able to provide better product recommendations based on visual similarities. It's hard to compete with Amazon as a retailer in terms of pricing data, which enables them to rapidly respond to competitor pricing and demand from consumers. But now, with the emergence of a few AI companies, retailers without an immense amount of data can still adjust prices automatically based on external data such as weather, local events, and competitors’ promotions. Reacting to data in real time is going to be massively important for retailers, and not just for pricing. It can also help direct advertisements, website changes, trigger emails, and more. As we've discussed before, AI is having a major impact in the merchandising segment of retail. Instead of having to consistently check and double check the inventory on the floor or in the back of the store, merchandisers can lean on AI to complete this task. Using the many security cameras retailers already have installed throughout stores plus image recognition, merchandisers can be notified if stock is running low. Plus, all this data can be used when planning out store displays and purchasing decisions. Online marketplaces are a great place to buy and sell items across a variety of niches - from food to used luxury clothes. However, it's vital that these environments are kept safe for shoppers in order to maintain and grow a user base. But when millions of people are listing products, how can a marketplace moderate out items that go against terms or service, are fake, or are even illegal? For most, the answer is in AI. By moderating based on text to using image recognition moderation solutions like ours, marketplaces are able to provide a more secure shopping experiences. Now that you have this primer on AI in retail, be sure to download our full ebook to learn even more about real, practical use cases!